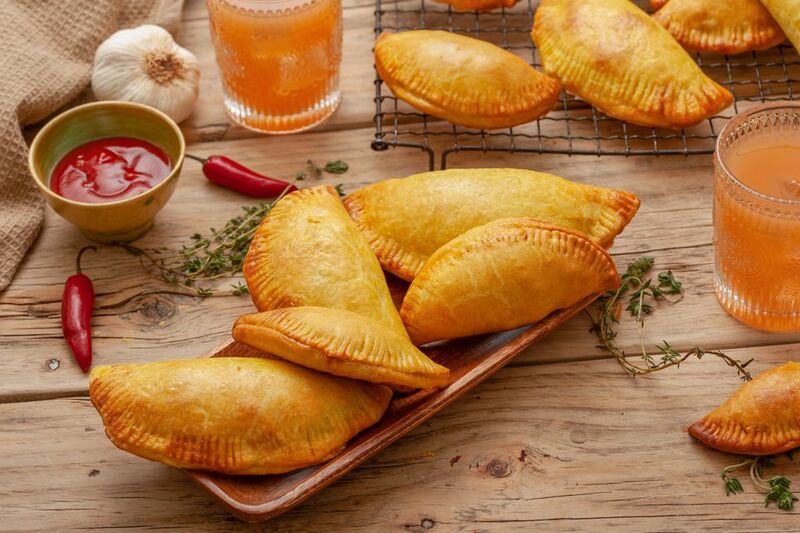 This Jamaican beef patties ​recipe is made with a flaky pastry and filled with a highly seasoned beef filling. These baked patties can be found throughout Jamaica at roadside food shacks, in snackettes, canteens and anywhere that sells food. It is a must-have if you ever visit Jamaica. They are easy to make and are much larger than traditional patties. A favorite way to eat them in Jamaica is sandwiched between coco bread (a yeasted sandwich bun that contains no cocoa and no coconut despite its name). Wash it down with an ice-cold beer, a hot beverage or a cold fruit drink. Note: while there are multiple steps to this recipe, this Jamaican beef patty recipe is broken down into workable categories to help you better plan for cooking. To a large bowl, add flour, 1 teaspoon salt, and turmeric and mix thoroughly. Rub shortening into flour until there are small pieces of shortening completely covered with flour. Pour in 1/2 cup of the ice water and mix with your hands to bring the dough together. Keep adding ice water 2 to 3 tablespoons at a time until the mixture forms a dough. At this stage, you can cut the dough into 2 large pieces, wrap in plastic and refrigerate for 30 minutes before using it. Alternatively, cut the dough into 10 to 12 equal pieces, place on a platter or baking sheet, cover securely with plastic wrap and let chill for 30 minutes while you make the filling. Add ground beef to a large bowl. Sprinkle in allspice and black pepper. Mix together and set aside. Add hot pepper, garlic, and thyme and continue to sauté for another minute. Add 1/4 teaspoon salt. Add seasoned ground beef and toss to mix, breaking up any clumps, and let cook until the meat is no longer pink. Add ketchup and more salt to taste. Pour in 2 cups of water and stir. Bring the mixture to a boil then reduce heat and let simmer until most of the liquid has evaporated and whatever is remaining has reduced to a thick sauce. Fold in green onions. Remove from heat and let cool completely. Beat the egg and water together to make an egg wash. Set aside. Now you can prepare the dough in two ways: in either two large pieces or smaller, individual pieces. ​Flour the work surface and rolling pin. If you had cut it into 2 large pieces, then take one of the large pieces and roll it out into a very large circle. Place about 3 heaping tablespoons of the filling onto 1/2 of each circle. Dip a finger into the water and moisten the edges of the pastry. Fold over the other half and press to seal. Take a fork and crimp the edges. Cut off any extra to make it look neat and uniform. Place on a parchment-lined baking sheet and continue to work until you have rolled all the dough and filled the patties. ​If you had pre-cut the dough into individual pieces, work with one piece of dough at a time. Roll it out on a floured surface into a 5-inch circle or a little larger. Don’t worry if the edges are not perfect. Place 3 heaping tablespoons of the filling on one side of the circle. Place on a parchment-lined baking sheet and continue work until you have rolled all the dough and filled the patties. Preheat the oven to 350 F. Place the pans in the refrigerator while waiting for oven to preheat. Just before adding the pans with the patties to the oven, brush the patties with egg wash.
Bake patties for 30 minutes or until golden brown, then cool on wire racks. To create an edge using a fork, simply press down on the edge, using the tines of a fork to both seal the dough together and leave a homey decorative pattern around the edges. This is a great method if you are looking to get the kids involved—or they are begging you to help! To create a rope-like crimp when closing up the patties, pinch the pie crust gently between your thumb and index finger, doing so at an angle and gently pulling up the outer edge of the dough with each pinch. The effect should look like the edges of a rope running all the way around the crust.